A Corner Brook artist is hoping a recent art project brings attention to an oil leak in Port au Port Bay. Qalipu Mi’kmaq painter Ronnie Rowsell is using oil seeping from an abandoned well in Shoal Point as paint for a new series of paintings. He wants to shed light on the concerns of area residents who feel government is not doing enough to stop the leak. 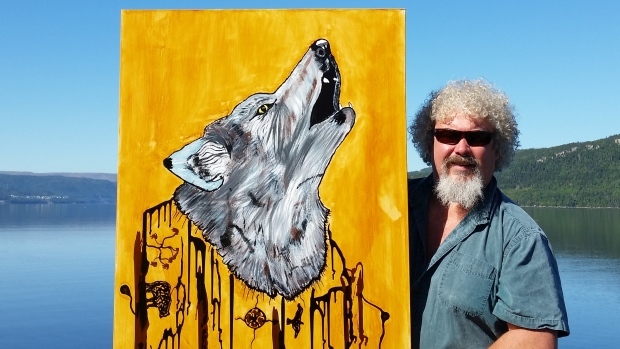 Rowsell, who was nominated for the Newfoundland and Labrador Arts Council’s 2015 Artist of the Year, decided to collect oil from the waters of Shoal Point and use it to paint a picture of the extinct Newfoundland wolf. “It’s just awareness that I’m trying to portray through my artwork,” he said from his studio on West Street in Corner Brook. The painting shows the wolf howling at the sky with the oil from Shoal Point dripping down on a number of different animals and symbols below, meant to illustrate the widespread damage that oil spills can have on the ecosystem. Rowsell said the Newfoundland wolf was a logical choice because it shows a recent example of what people have done to native species in the province. “We slaughtered an animal that was inhabited to this island at one time, and we are quite capable of causing desecration to other species,” he said. The wolf painting will be the first of several Rowsell is working on over the next few weeks. He plans to continue using the oil to paint other wildlife extinct or threatened by human activities, such as the polar bear. Before becoming a full-time artist, Rowsell worked in the mining industry for 27 years, which took him to various corners of the world. Now that he’s retired, he creates commissioned works for paying customers in addition to pursing his own projects like the ones with the Shoal Point oil. Since posting a photo of the painting on social media, he’s been contacted by dozens of interested buyers — but said he has no plans to sell it. Memorial University also reached out to Rowsell to see if it could put the painting on display on the St. John’s campus. In the meantime, he said he’s been following the lead of his Qalipu elders when it comes to speaking out about Shoal Point, and hopes that he can play at least some small part in stopping the leak before it causes any more damage. “The comments are very positive and it’s causing a lot of awareness,” he said. 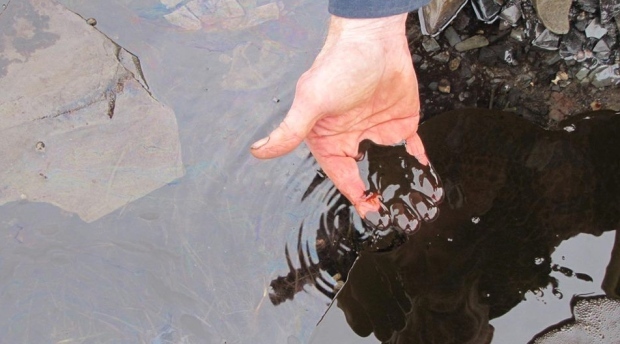 Posted on September 28, 2015, in Oil & Gas and tagged oil spill, Port au Port Bay, Qalipu Mi'kmaq, Ronnie Rowsell. Bookmark the permalink. Leave a comment.